Since opening in 1936, it has been Brighton’s most inharmonious building and like many famous controversial characters, it has just had a facelift. The gleaming white façade of Grade II* Listed Embassy Court was recently unveiled after decades of neglect, years of legal battles, months of work, and days of nail-biting. Boy, was it worth the wait. 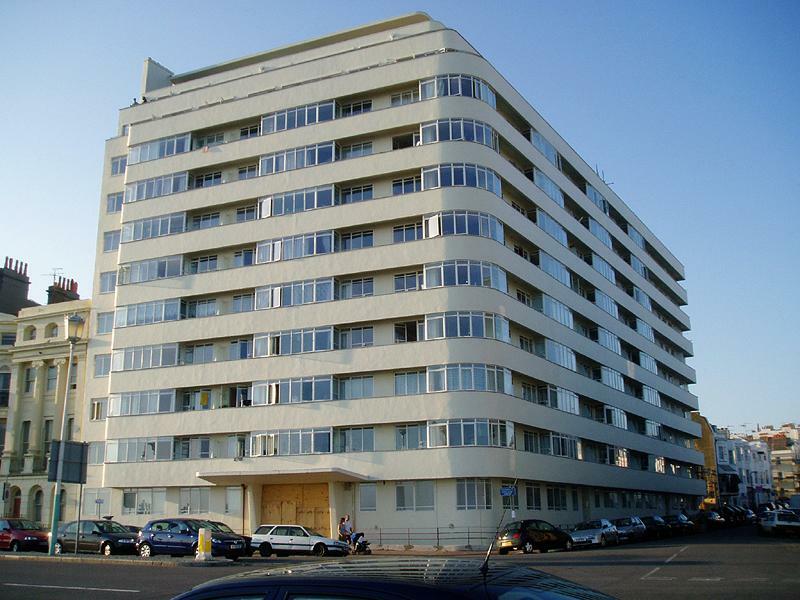 Embassy Court, like a gleaming cruise liner moored beside ancient galleons, was built just on the Brighton side of the border with Hove on the site of a detached property called Western House. It was one of the first blocks in England to offer lock-up garages and purpose-built penthouses. The original brochures boasted of sun-admitting Vista-Glass sun parlours, open balconies and unlimited hot water. In its heyday there was even a bank and restaurant. Famous former residents include comedian Max Miller, novelist Keith Waterhouse, actor Rex Harrison and property tycoon Nicholas van Hoogstraten, to name but a few. The front doors were originally bronze and I would love to see the current doors replaced as such. Wells Coates was the architect and local politician and benefactor, Sir Herbert Carden, loved the design so much that he wanted to replace the entire historic seafront with similar buildings. The Regency Society was formed in 1945 to counter the proposed offensive. Often dubbed Art Deco, Embassy Court should really be described as Modernist. Unsurprisingly, Coates, who was born and raised in Japan, was at the forefront of the Modern Movement in architecture and design in Britain and lived by the motto, “form follows function”. A 1980s freeholder of the building told me that “the trouble started when absent leaseholders who were renting out their flats were unwilling to put money into the building”. It is generally assumed that Hoogstraten was the behind the scenes owner but this is simply not true. The leaseholders’ company, Bluestorm Ltd, bought the freehold in 1998 after prolonged legal battles with Portvale Holdings Ltd, who had been the owner since 1994. The restoration commenced in 2004 with assistance from Sir Terence Conran and the hard work of a dedicated has certainly paid off. This story has a happy ending as the building now looks great after several million pounds of work. This 1930s cruise liner has ridden the storms of time to arrive safely into the 21st century, completely unaware that Regency Brighton may have been the wrong destination all along!